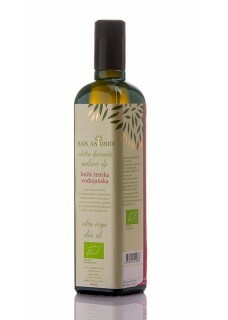 Buža ženska Vodnjanska is medium intense olive oil, medium defined smell and taste of the olive fruit. Very tasty harmonious oil, where the bitterness and pungency slightly visible. Balanced flavor and sweetness of the apples give Buža ženska Vodnjanska freshness. Leccino and Pendolino. Olive plantation is on 100-200 meters altitude and 800 meter from the sea. Every tree have its own irrigation 'drop by drop', which is essential for quality of olives. In 2014. stancia "San Antonio" bought new oil plant for pressing oil with separation units, and is one of 5 in Europe, and the only one totally new in Croatia. This is why they produce only extra virgin oil of highest standards. It is produced only by mechanical way on temperatures no higher of 27 Celsius . With this new technology there is more green colour, more polifenols so essential and crucial for oil taste, and it also lasts longer. After pressing their oils, they are immediately filtrated (in order to separate the last organic residues that could spoil the oil) and put in tanks without any oxygen presence. So prepared "San Antonio" olive oil have from 0,10% up to 0,20% free fat acids, much less than the maximum allowed percentage of 0,80.
extra virgin olive oils in Tokyo Japan in 2015. One of the best Croatian olive oils, and now on Croatianwine.eu.